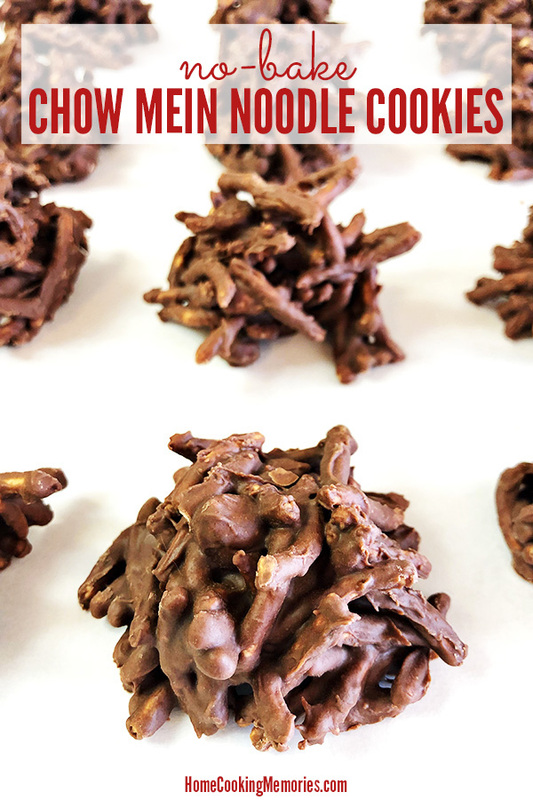 Our No-Bake Chow Mein Cookies recipe has been a family favorite for years! 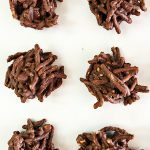 It’s a simple refrigerator drop cookie that only needs 4 ingredients: crunchy chow mein noodles, butterscotch chips, chocolate chips, and peanuts. 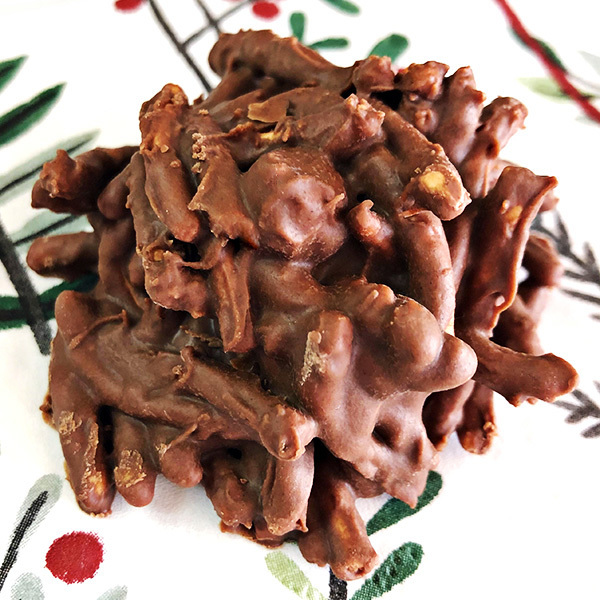 Nearly 30 years ago, I was introduced to my grandmother-in-law’s No-Bake Chow Mein Cookies. Well, she actually called them “Chinese New Year Cookies”, but my family and I always preferred to call them “Chow Mein Cookies”, so that’s the name that always stuck with us. During Christmastime, she would make a table full of holiday treats. After our holiday dinner with her, she would create a plate of goodies for us to take home. The Chow Mein Cookies were always one of the first to go. I loved that tradition, so after a few years into our marriage, we started the tradition of making lots of holiday treats too. I usually picked treats to make that were fairly easy or ones that were special to me, such as Chocolate Chip Cookies and Christmas Candy Cane Cookies. 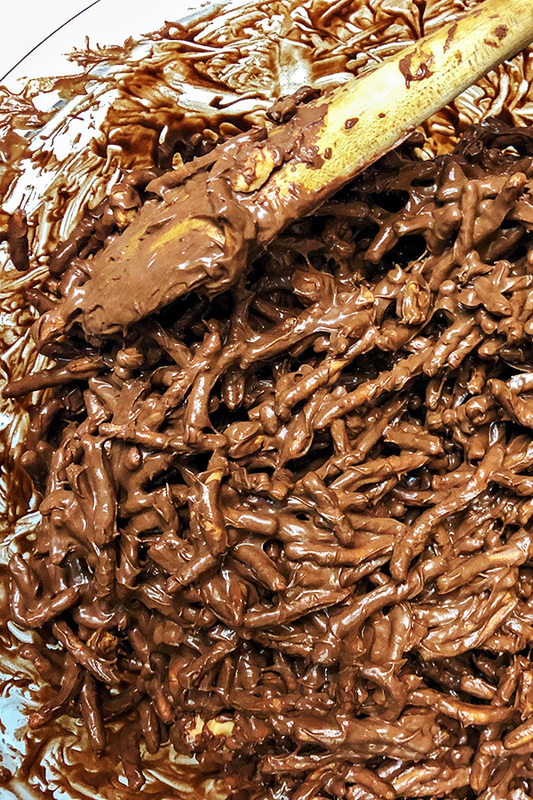 And these No-Bake Chow Mein Cookies have also been made every year. 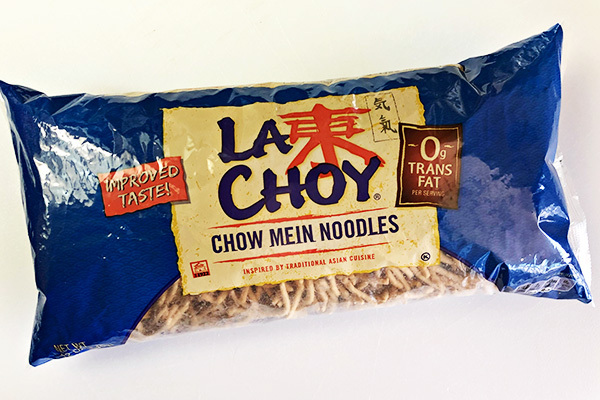 If you are unfamiliar with chow mein noodles, they are a crunchy, fried egg noodle sold in the Asian food section of most grocery stores. Look for them in a bag like you see in our photo (your store may sell a different brand). You may also see chow mein noodles sold in a canister, but we recommend trying to find the bags as they are usually less expensive. 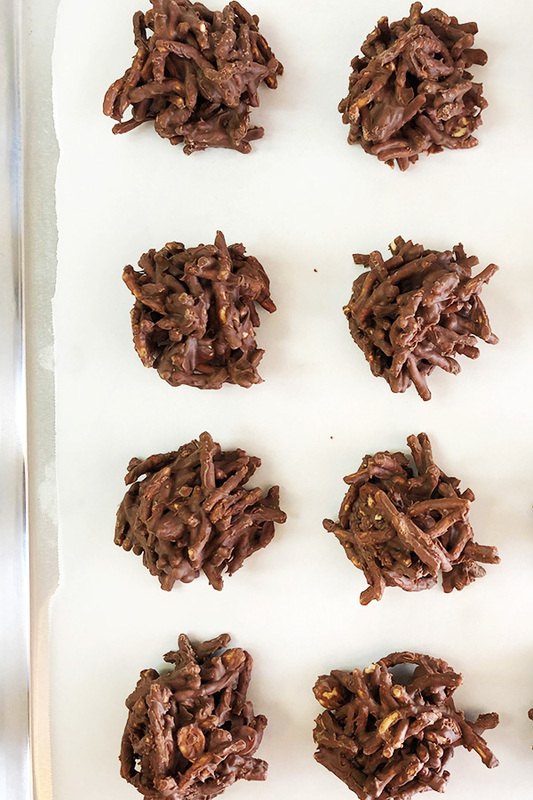 No-Bake Chow Mein Noodle Cookies don’t have to be baked in an oven. As long as you have a microwave (or stovetop) and a refrigerator, you can make these. First, line baking sheet with wax paper or parchment paper. Be sure that the baking sheet you use will fit in your refrigerator. If you have limited space in your refrigerator, you can use a dinner plate or another smaller tray-like item. Combine both the butterscotch chips and the chocolate chips in a large microwave-safe bowl. Make sure that your bowl is large enough that it will hold all of your chow mein noodles, along with the chips and the peanuts. A bowl that holds at least 2.5 qt will work. You’ll start by melting the chips together in the microwave, stirring chips every 30-45 seconds, until smooth. The key is that you want to stir the chips often. Once the chips are smooth and melted, you will begin folding in the chow mein noodles a little at a time until they are completely coated mixture. Then gently fold in the peanuts until they are completely coated. Finally, drop chow mein mixture by the spoonful onto your prepared baking sheet. We do this by using two teaspoons, one to scoop up some of the mixture and the other spoon to help scrape the mixture off of the other spoon and onto the baking sheet. If any of the chow mein noodles or peanuts escape from your mound, just push it back to the chow mein mixture. To help the Chow Mein Cookies set up, we have found through the years that placing them in the refrigerator is best. You may find that you don’t need to place them in the refrigerator, but this does speed up the process. Once the Chow Mein Cookies have set, store them covered at room temperature. Here is the full recipe, ready for you to print. Like this recipe? 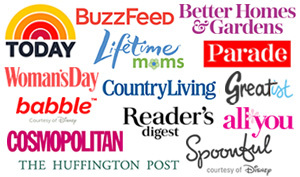 We’d love for you to pin to your Pinterest board or share it on Facebook! Thank you for your support! Place both the butterscotch chips and the chocolate chips in a large microwave-safe bowl. Melt the chips together in the microwave, stirring chips every 30-45 seconds, until smooth. Remove from microwave and begin folding in the chow mein noodles a little at a time until they are completely coated with the melted chip mixture. Fold in peanuts until they are completely coated. Drop chow mein mixture by the spoonful onto prepared baking sheet. Place baking sheet in the refrigerator until Chow Mein Cookies have completely set. Once Chow Mein Cookies have set, store covered at room temperature. –The peanuts can be removed if you prefer. Or other salted nuts can be substituted.